Calculated Risk has framed an interesting Inflation Debate Between Volcker vs. Kohn without weighing in on the matter. I will gladly weigh in, but first let's review the articles. In the Wall Street Journal article Heavyweights Kohn,Volcker Spar Over Inflation Goal Volcker was quoted as saying "I don't get it," ... By setting 2% as an inflation objective, the Fed is "telling people in a generation they're going to be losing half their purchasing power." Former Federal Reserve Chairman Paul Volcker said Congress will probably review the authority granted to the Fed following emergency credit programs doubling the central bank’s balance sheet to $2.19 trillion. “I don’t think the political system will tolerate the degree of activity that the Federal Reserve, in conjunction with the Treasury, has taken,” Volcker, head of President Barack Obama’s Economic Recovery Advisory Board, said today at a conference at Vanderbilt University in Nashville, Tennessee. “I think for better or for worse we are at a point where the Federal Reserve Act, after all that has been happening in the last year or more, is going to be reviewed,” Volcker said. Lawmakers including House Financial Services Committee Chairman Barney Frank have said Congress should consider revising the Depression-era emergency provision. “It’ll be very interesting to see what the role of the Federal Reserve will be,” Volcker said. The possibilities “range all the way from giving the Federal Reserve more supervisory and regulatory responsibility to largely taking away” those powers. Bernanake and Kohn want a 2% inflation target. Exactly what good would it do? Bernanke is struggling massively right now to produce any inflation and cannot do it. At other times inflation is running rampant but it shows up in asset prices that are impossible to measure. 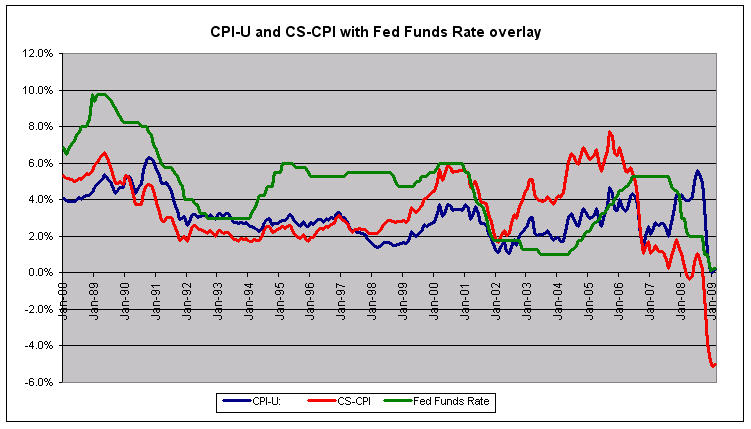 Moreover prices can change for all kinds of reasons totally outside the control of the Fed. For example, China's demand for raw materials is certainly going to affect prices is it not? Is the Fed supposed to wave its magic wand and prices bow to its wishes? Even IF the Fed could produce inflation at 2%, Volcker is correct about the cumulative effects over time. But the fact is the Fed cannot hit an inflation target as prices cannot be measured and a representative basket of goods and services cannot be found. Please consider the following discussion for starters. "Owners' Equivalent Rent" (OER) is the largest component in the government measure of the Consumer Price Index (CPI). OER is a process in which the BEA estimates what it would cost if owners were to rent the homes they own from themselves. OER is not a valid pricing barometer. The following chart shows the effect if one substitutes the Case-Shiller housing index for Owners' Equivalent Rent in the CPI. Please see CS-CPI Negative 5.0% Third Straight Month for details about CS-CPI, a more realistic measure of consumer prices than the widely reported CPI. I have the CPI at -5%. The Fed with its OER measure differs by 5%. That's a huge difference. So how should housing be measured? I propose using Case-Shiller. Let's assume agreement even though agreement does not exist. The next question is: What weighting should housing have in the basket? The answer is I do not know, nor does anyone else. Certainly renters will feel differently about this than home owners. What about property taxes? Those are not factored in at all. And certainly education expenses are a lot more important to someone with 4 kids in high school than someone else who is retired. Do we ignore food and energy or not? What about asset prices? There is no question that inflation this go around was concentrated in housing prices and financials and last go around in Nasdaq stocks. Does anyone care to put a weighting on asset prices or do we ignore asset bubbles like we did in 1999-2000 and more recently 2005-2007? I believe the above questions are impossible to answer. Assuming you agree, then it is impossible to select a representative basket of goods, services and assets to measure. For the sake of argument however, let's assume one could pick a representative basket of goods and services and one could properly measure it. Now, what is the likelihood in a global economy for the Fed could actually manipulate interest rates and money supply to achieve its target? I contend that is impossible as well, and the actions of the Fed over the past two years proves it. 1. It is impossible to pick a representative basket of goods, services and assets. 2. Even if one could by pure luck manage to do so, measuring that basket is in and of itself impossible. 3. Even if a magic fairy told the Fed what the basket was and how to measure it, it is virtually impossible for the Fed to tweak interest rates and money supply to hit that target. There are simply too many factors in a global economy for the Fed to control prices that closely. Here are three of them: currency fluctuations caused by changing interest rate differentials, currency fluctuations caused by other central bankers printing money, increasing or decreasing demand for goods and services in emerging markets. How anyone can possibly dispute those points? However, let's wave our magic wand one more time and suppose all three of those fatal flaws did not exist. Would inflation targeting be a good idea? Of course not. The simple fact of the matter is inflation benefits those with first access to money (banks, the already wealthy, and government). By the time those on the lower socioeconomic scales have access to money, asset prices are inevitably too high for them to benefit. Given that inflation benefits those with first access to money, any targeted inflation at all is morally wrong. Finally, for all this silly talk about inflation fighting and inflation targeting, its important to remember what inflation really is. Inflation is an expansion of money supply and credit, where credit is marked to market. Prices generally follow money supply but there is a variable time lag, productivity and consumer sentiment are huge factors, as are a host a host of global factors including interest rate differentials and currency fluctuations. So even if the Fed could achieve that magic 2%, the whole shebang would eventually blow sky high anyway (as it just did) because wages will not keep up with prices causing asset bubbles to pop. Clearly, Inflation Targeting Is Doomed To Fail. The only inflation target that makes any sense is none. And the only way to achieve that is to abolish the Fed and fractional reserve lending right along with it. The free market left alone would work better than anything else, if only given a chance.